All the latest news happening in the bags, cases and accessories segment of MI, crucial for add-on sales at your stores. 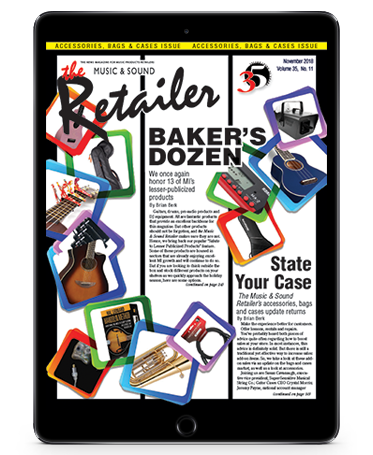 The Music & Sound Retailer brings back its popular “Salute to Lesser-Publicized Products,” with a look at 13 items from 13 companies. Yamaha’s MODX Series with synthesizers are lightweight, offering excellent mobility. Take them out on the road with their aluminum chassis. There are few hotter sellers at MI stores than ukuleles. We get info regarding why ukuleles are growing, as well as the unique story behind Cincinnati’s Amahi Ukuleles, a division of Amati’s Fine Instruments, from President Michael Schear. Meredith Hamlin, CEO of Kyser Musical Products, was a tire technician on a stock car racing team in the late ’90s. And that’s only one of the cool facts about her. There’s so much for a spy to do in Chicago, specifically look for drums and percussion instruments. 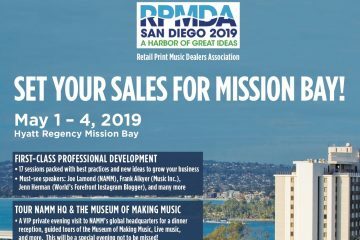 Shure’s Abby Kaplan returns again this month to discuss how to keep the Black Friday momentum going year-round. The holidays are often the strongest time of year for MI retailers. But that doesn’t mean success is guaranteed. Time Spicer explains how to end the year right. Robert Christie reveals the 10 biggest lessons he has learned from his 25 years in MI. There are three facets of a new product that will sell successfully. Allen McBroom explains. Video marketing is unique in its ability to reach your audience on a deeper, more thought-out level than almost anything else. Gabriel O’Brien details how to be successful in this arena. When it comes to a robust MI retail operation led by a husband-and-wife team, look no further than Ossing, N.Y.’s, Mike Risko Music. In fact, Mike Risko and wife Miriam were wed in its music school. Like Allen McBroom, Dan Vedda has new products on his mind this month. There are always a few products that stand out every year and Vedda thinks it’s in our best interests to detect these and “wave the flag” about them.